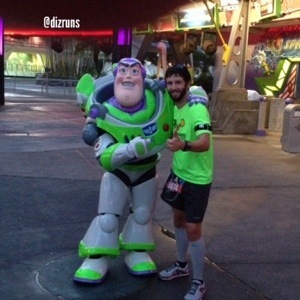 This past weekend I ran my 3rd Disney Marathon, which was my 5th full marathon overall. There is a lot to love about runDisney events, but after running a handful of non-runDisney events (halves and fulls) I’ve come to learn that runDisney definitely leaves a few things to be desired as well. 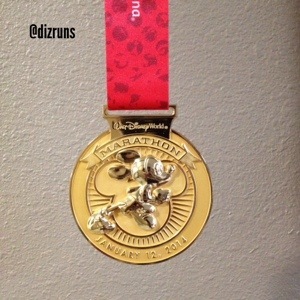 The Bling–Disney events tend to feature some pretty nice finishers medals. This year was no different in my book. Big. Gawdy. Heavy. Love it. Characters on the Course–If you’re running in a Disney race, you’re going to see lots of characters out there to take pictures with, if you’re so inclined. Not only are Mickey and Minnie out there, but there are also a lot of characters out and about that aren’t regularly seen in the parks. This was my 8th runDisney event, and this was the first time I actually stopped to take a bunch of pictures. Great decision. Lots of Company–This is a double edged sword, because having lots of fellow runners means that the course can be a little crowded sometimes, and not all runners are familiar with proper runner etiquette. But after running a race in October where I was pretty much alone for 18 of the 26 miles, it was nice having some company from start to finish. Corral Placement is a Joke–On paper, putting runners in order by their projected finish time, and sending them out in waves is a good idea. runDisney fails when it comes to putting this idea into practice. Nothing against walkers or run/walkers, but they shouldn’t be in one of the first couple of corrals in a race this size. When they stop, and usually it’s more than one person at a time, it creates an instant road block. And since the course is crowded virtually the entire way, it can be a hassle to get around them. I don’t know how some people got into the corrals they did. Lack of Guest Relations/Customer Service–For a company that is so focused on making guests happy, Disney dropped the ball when it comes to runner relations at the race expo. I have a friend that ran the race, her first full, and when she registered she didn’t have a qualifying time to give her a good corral placement. She was hoping for a sub-4:00 race, and ran a half in November in 1:50 and change, which should have placed her in one of the better corrals. runDisney, however, decided that November was too late in the year for a change in her corral placement to be changed on her bib, and for the first time that I’m aware of, they wouldn’t permit her to change her corral at the expo even though she had a verifiable qualifying time. She still managed to run 4:01 while weaving through, literally, 1000’s of slower runners that were able to get corral placements that my friend should have. When it’s all said and done, I had a blast running this race. Stopping for pictures with the characters was a first for me, and it really made all the difference. If you’re trying to run a race for a fast time, and don’t want to stop for pictures, you might want to try another option. But if you’re looking for a fun race to run, the Disney Marathon is a pretty good choice. I doubt I’ll make the Disney full a regular event on my race schedule, even though I’ve run 3 of the last 4, but I’m leaning toward doing it again next year. I’m thinking about doing the Goofy Challenge next year, but that might be my last Disney full for awhile. Anyone want to run it with me? Have You Ever Run a runDisney Event? Did You Run in the Marathon Weekend This Year? What Were Your Thoughts of the Event? Congrats on your finish. I appreciate your honest review. I also feel for you about being the lone runner for the last 8 miles of a marathon….mentally pretty tough. I wasn’t trying to bash the Disney races at all. Since I live close, I run at least one every year, but they aren’t as perfect as many bloggers make them out to be. I just wanted to give my honest take, and my readers can decide if they want to try a Disney race or not. And a solo last 1/3 of a marathon is brutal! Try to avoid it at all costs! I didn’t think you were bashing it at all. Just being honest. I think they were insightful. Last year I ran a marathon in Northern Michigan. Most of it took place on a rail trail. From mile 19-26 I was pretty much alone. Didn’t see any other women and would pass someone every half mile and be alone again. I had a great race and finish and qualified for Boston but geez it starts to mess with your head! Congrats on the BQ. Someday I’ll get there, but I won’t be able to stop for pictures with a bunch of characters along the way! Where in Michigan did you run your marathon? I’m from up there originally, and still need to knock out a marathon in MI for my 50 state challenge. I’m not sure I’d like to run Detroit or GR, but something up north closer to home might be fun. I ran Charlevoix. It was beautiful. I am originally from Kalkaska. My husband laughs because when people ask where I am from I say Traverse City and he will say,”Tell them where you are really from.” Funny enough we now have a summer home there. Where are you from in MI? Grew up in Manistee. Glad to be down south this time of year, but it’s nice heading back home in summer or fall. Wonderfully written article sir. Congrats on the race, and I loved seeing the pictures! I’m for the Goofy next year sir!